dot linking: One word... yikes! I'm doing one of the two amateur stages of the Tour de France in July (known as L'Etape) which is a one-day, 205km cycle over part of the Massif Central from Issoire to Saint-Flour. Training for that to date has been a fair amount of spinning at Virgin Active and cycling at the weekend around Richmond Park. This weekend was the first venture into something longer and challenging at one of Evans Cycles Ride It! sportives, which started and finished in Esher, Surrey. To get an idea of how this compared to L'Etape, I used the excellent gpsvisualizer.com which, amongst other things, can convert KML files (this is what Google uses to plot tracks, etc. 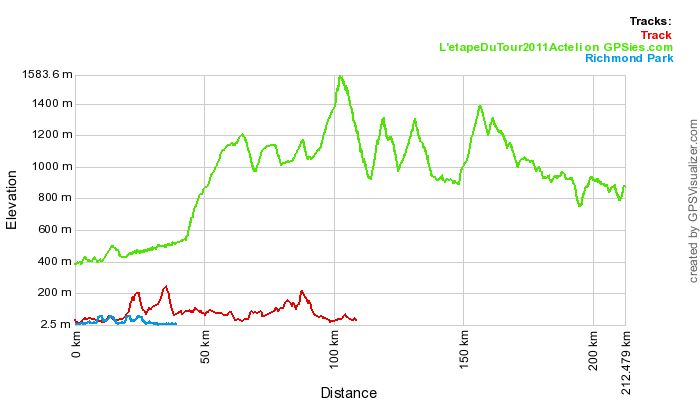 on maps) to GPX files (which can be read by GPS systems), but can also plot the elevation profile of a route. 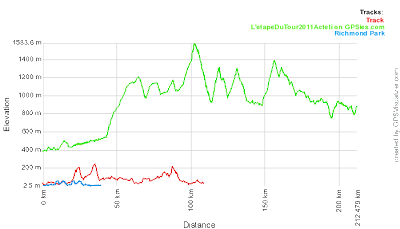 The chart below shows three routes: L'Etape in green, the Evans route in red and my typical Richmond Park jaunt in blue. One word, yikes!